It is with a very broken heart to let you know that our GRROWLS angel Penny crossed Rainbow Bridge on April 2nd, a month shy of turning 14. She came to us at the age of 11 with her puppy to foster. When we met her for the first time, I so remember her beautiful, bright eyes and big golden smile. She was a tiny, sweet Golden mom with her chubby puppy. We certainly learned a lot. She was such a good mom and did not like any of our 3 Goldens anywhere near her puppy so the kitchen became her nursery. Her puppy was adopted and she was finally ready to be spayed where a mammary cancer was found and lump on her hind leg was also removed. At that point, we could not give her up and we wanted to take care of her and give her a loving home and family where she would not have to have any more puppies!! So we adopted her!! We have been so blessed and she has touched so many hearts. Our kids fell in love with her right away and, as her illness became worse, we could not imagine not having her with us. I can’t tell you how many times the kids would say “I wish we could have had her as a puppy”. She was able to do a few home visits for GRROWLS and, of course, the families loved her! She was very close to our Riley who crossed the Bridge a year ago and was so sad without him. I think they both thought we rescued Goldens have to stick together, and they really did. Penny’s prayers were answered when Goldie came into our lives and Penny had a best friend to lay close to and Goldie had a new big sister to help her feel safe and loved in her new forever home. Our Penny will be forever in our hearts. Although we only had her for three years, it felt like she had always been part of our family. 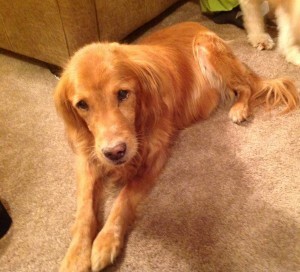 She is now pain free and I am sure Riley, Chloe & Bailey met her at the Bridge to run and play. We miss her so much.